"I take a spoonful every day and it gives me just what I need a little energy, a bit of clarity and a little bit of peace." "My energy levels are steady throughout the day. I no longer need my afternoon cup of coffee. " "Wonderful will definitely keep purchasing "
"I enjoy taking Hanah first thing in thing in the Morning. It has help me with my mental fogness and with my sleep simply amazing "
"I love it! I’m so glad I found it. Makes me feel so healthy!" "Unbelievable product, everything this product promises it delivers. I am 44 years old and work in an office all day long. Hanah One has given me all day energy, better moods and better focus. I hope they never run out"
"I have been taking a tablespoon of Hanah One every day for some months; no adverse effects. I am a normally high energy type, so I can't say I have noted any change there." "I have been taking the hanah one for a few weeks so far and have just started the ashwagandha. Have noticed a bit more energy, especially in the afternoon, and I've only taken the ashwagandha twice. Looking forward to see what happens down the road and will probably order the ghee. These products are the real thing, you just need to give them time to do what they say they will do." "Maybe it’s too early to tell, but I think that the energy boost I get has more to do with the high sugar content than it does with the herbs and superfoods. I certainly appreciate the supplement and that it probably takes time to accumulate benefits. (I should probably ask just how long it takes to experience benefits.) I’m willing to try it for a while, but it is pricey if the benefits are anything less than wondrous. Thanks." "Seriously, this stuff works. Ill be honest it took a while to get used to the taste. Somewhere between bark and dirt. The taste didn't matter as I noticed a difference the first time I took it. I have more consistent energy, focus, better attitude and I sleep like my 4 year old. I'm am a Hanah user from here on out. " "I opted for the auto-monthly shipment of HANAH and from the first delivery ive already noticed a change. The to-go packs makes it easy to stay on target everyday. " "I thought I cancelled this. Please make sure this is cancelled - thank you"
"Bad, didn't know I was ordering auto renew. Not sure how I missed that but it felt sneaky. Maybe user error, just make sure you're not trying to trap people into auto renew, with shaddy UX tactics. :) Other than that product seems good"
"I absolutely love Hanah One. I put it in my morning routine, and find it gives me sustained go-power throughout the day. I finally feel my body working for me rather than sluggish. " "Plenty of energy for a workout "
"Being a healthcare professional, I was apprehensive about this product as well as the claims made by others. My brother told me about all the benefits he experienced from Hanah One so I decided to put the product to the test and OMG, I'm so glad I did. I want to shout from mountain tops how great I feel since starting Hanah One. The first few days were definitely the energy boost and elevated mood. Then after about a week I noticed my workouts are stronger and muscle recovery is quicker. I can't speak highly enough about this product. It's an absolute must try! " "Results were decent...price and taste not so much"
"Enjoying ONE but would love the ashwaganda Thank you Understood it was on it’s way Cheers "
"I really enjoy Hanah. I have been using it approximately 2 years (or more). I can tell a huge difference. Thank you!!" "More energy, best supplement out there"
"One tablespoon for Twenty days and I signed up to receive one jar every twenty days. I sleep and thrive optimally, daily! " "I started taking this product a couple months ago on a daily basis as recommended and I do not think I will ever stop! The benefits far outweigh the cost. Being able to focus more at work, gives me that extra push at the gym or for those last few miles on a hike. Perfect formula for an active lifestyle. I will say that it is an acquired taste, at least it was for me. However, now I am putting it in smoothies, coffee, and eating it straight out the jar. Hoping to be at super hero status by summer 2018. Thanks HANAH ONE! " "This combo is awesome! I’ve been putting it in breakfast smoothies everyday and I feel more focused and self aware ALL DAY! Have to admit the taste was kind of hard to get over at first but now I’m acquiring a taste for it. Love this product certainly worth the money. " "Excellent. Love starting my day with this product. Gives me clarity and alertness from the beginning." "I was skeptical about what my results would be by taking Hannah. I have been taking it everyday for 5 weeks and I love it. I feel sharper and I am recovering from my runs faster . I did not feel bad before I was taking it but now I feel healthier. I know my running is better and my mind is clearer. " "I really felt a boost of energy. I wouldn't say significant, but it definitely makes me feel good. I also love knowing I'm putting all these amazing ingredients in my body every morning that you normally wouldn't consum on a daily basis. My fave way to use Hanah is to blend it every morning in my MATCHA LATTE. It gives it this sweet cinnamon taste and is the perfect combo! I highly recommend!" "Superb! Will need more soon!" "This is my second bottle of Hannah ONE and so far I am very satisfied with the product. It helps to bring smooth consistent energy and a general sense of well being. Taste is different but manageable knowing all the benefits it provides. With all the great benefits, it is only fair I list the disadvantages. Serving size of 20 servings is way too low given the cost of $50. This is the only thing that keeps me waiting for a sale to be ran before I reorder a new bottle. Overall, a fantastic product with a tremendous impact on my life but with a short serving size at a high dollar per serving. Regardless, I will order again on the next sale!" "3 weeks of daily use. Seems like it helps me zone in in the mornings and I've been sleeping noticeably better too. 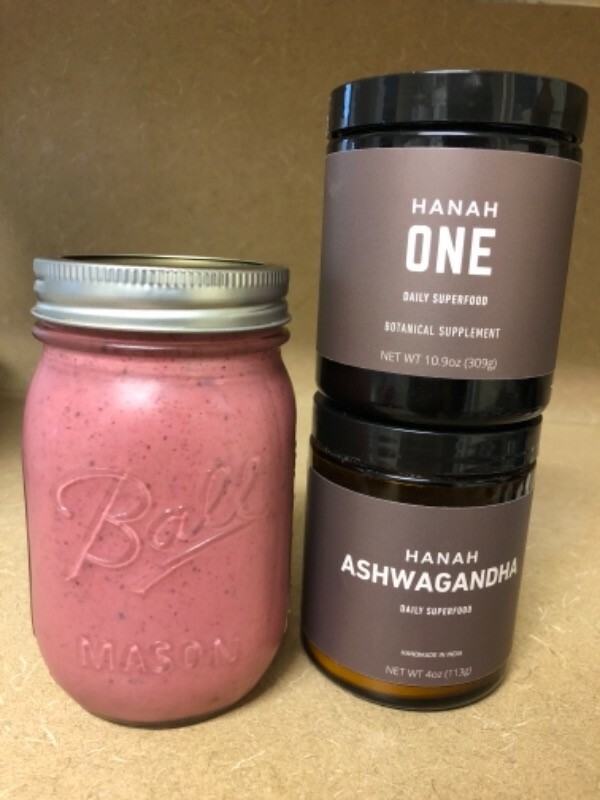 Investing in HANAH helped me commit to start living better day to day which is pretty much why I tried it out- thumbs up"
"I love this stuff in every way that I've tried it... what I don't care so much for is the consistency of the jar... I've never got the # of servings listed and always use the same "tablespoon" measuring spoon... sometimes the jar is filled to the top when I first receive it and other times it seems like it isn't as full. Kindy pricey if the jar doesn't provide the # of tablespoon servings as indicated."